After all the hype and a three-year-plus wait, the official release next week of Microsoft Windows 2000 seems like a bit of a letdown. But the hulking operating system works'and fairly well. It looks so much like Win98 that power users of NT will have to relearn it because the most powerful parts of NT are hidden behind a new facade. All the same, it's definitely an NT successor. How do I know? I took a risk and simply upgraded my working NT 4.0 client. I succeeded, although the installation did have anomalies. 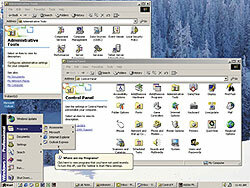 I've installed and uninstalled hundreds of software applications on my 450-MHz Pentium II in the GCN Lab. Many apps tend to leave poltergeists'little reminders of long-deleted programs that annoyingly keep popping up again, and again, and again. After the initial in-stallation, I proceeded to upgrade the OSes on a variety of the GCN Lab's desktop, notebook and server systems. There were only a few glitches, mostly related to a lack of software drivers and to incompatible apps such as antivirus programs. Microsoft will likely resolve some such problems by Win 2000's Feb. 17 launch date. Prior to installation, Win 2000 issues a report on the target system's hardware and software. Windows 9x users should take particular care to read the report and make as many of the suggested corrections as possible. In the next issue, the GCN Lab will detail how to make smart use of the Computer Management tools, as well as other tips for upgrading to the Win 2000 environment. Also, check out www.gcn.com/gcnlab for more how-to help. From now until Feb. 25, the site will feature daily postings on Win 2000 tips and tricks.